In my humble opinion (and that’s what counts, since I’m the reviewer!) Partners in Crime gets Series 4 off to a flying start. 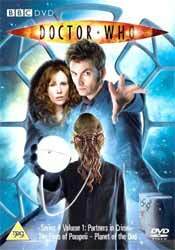 Some others I have spoken to hate this episode, and Catherine Tate and the Adipose in particular, but I loved them. Interestingly, I have observed a gender split among my friends in their appreciation of this episode, with women tending to like it and blokes tending to dislike it. Does this mean that I am in touch with my feminine side? I was already a fan of Tate, through her sketch show and her debut as Donna in The Runaway Bride, so it took me no time at all to bond with her. The character’s more abrasive edges have been softened by writer Russell T Davies, in order to make her more palatable to the less easily convinced, though her role in this episode remains a largely comedic one - the highlight of which is the miming sequence halfway through the show, in which the Doctor (David Tennant) and Donna notice each other for the first time, having kept on just missing each other up to that point. And talking of recurring themes, the brief appearance of Rose (Billie Piper) took me completely by surprise. I knew she was coming back, but not this soon. I had my doubts about the notion of bringing her back, but it is well handled in this instalment. The episode also boasts excellent dialogue, exciting Bond-movie-style action sequences and incidental music, and the irresistibly cute little Adipose. Who says all aliens have to be scary? One possible criticism of Partners in Crime is that it rehashes the basic plot of the first episode of The Sarah Jane Adventures, Invasion of the Bane, with the splendid Sarah Lancashire standing in for Samantha Bond’s character, breeding alien progeny in the process of selling a new product to an eager and unsuspecting public. Apart from that, though, it would be a crime to miss this episode. The Doctor and Donna arrive in Pompeii, AD79, where psychic powers and stone beasts run riot - and it’s volcano day! Donna challenges the Time Lord like no one has ever done before. Can she dare the Doctor to change established history...? Whereas Partners in Crime is a largely comedic episode, the next two instalments embrace more serious matters. The Fires of Pompeii features a moving performance by Tate, as Donna tries to persuade the Doctor the save the doomed people of Pompeii. He explains why he can’t, along the way clarifying why the Doctor is sometimes able to intervene in historical events (after all, even our future is somebody’s past) but sometimes isn’t. ALTERED TIMELINE: this is the timeline brought about by the Pyroviles and visited by the Tenth Doctor and Donna. Vesuvius will not erupt in this alternate timeline. The Tenth Doctor’s actions restore the original timeline. The Doctor is going to have to make a note to himself for the future, though. After the insubordination of Mel in The Fires of Vulcan and Donna in The Fires of Pompeii, he should never again take fiery redheads to Pompeii - they’re just too argumentative! As well as The Fires of Vulcan, this story borrows, either consciously or unconsciously, from a couple of other Who serials. The fire-worshipping Sybilline Sisterhood are reminiscent of the Sisterhood of Karn from The Brain of Morbius (soon to return in Big Finish’s Sisters of the Flame), while the possessed High Priestess (Victoria Wicks) who hides her true form behind a curtain is a variation on Padmasambhava in The Abominable Snowmen. The Fires of Pompeii is an exciting and visually pleasing episode, which throws up some interesting ideas. Following a couple of unusually long episodes, each of which tops 48 minutes, Planet of the Ood is a compact and bijou 43 and a half minutes long. It is snappily directed by Graeme Harper, and kept me riveted throughout. Writer Keith Temple builds upon what little we already know about the Ood from The Impossible Planet / The Satan Pit to explore how the creatures became servants to humanity (though I’m not sure that a species being dependent upon a single giant brain is any more believable than a species being born into servitude). The script deals with slavery (a topic curiously never touched upon in The Fires of Pompeii), along with more topical issues such as the exploitation of Third World labour and the inhumane treatment of livestock. The unofficial back-story about the Ood-Sphere occupying the same solar system as the Sense-Sphere (from The Sensorites) is confirmed in this episode, which features an appropriately retro-style space rocket. DONNA: Woo, enjoying that spaghetti, aren’t you? OOD: I am not eating spaghetti. These tentacles are part of my facial features. All in all, Planet of the Ood is very gOod.